Locals know it to be true and visitors to the region are just discovering it—Klamath County, Oregon, has some of the most scenic hikes on the West Coast. 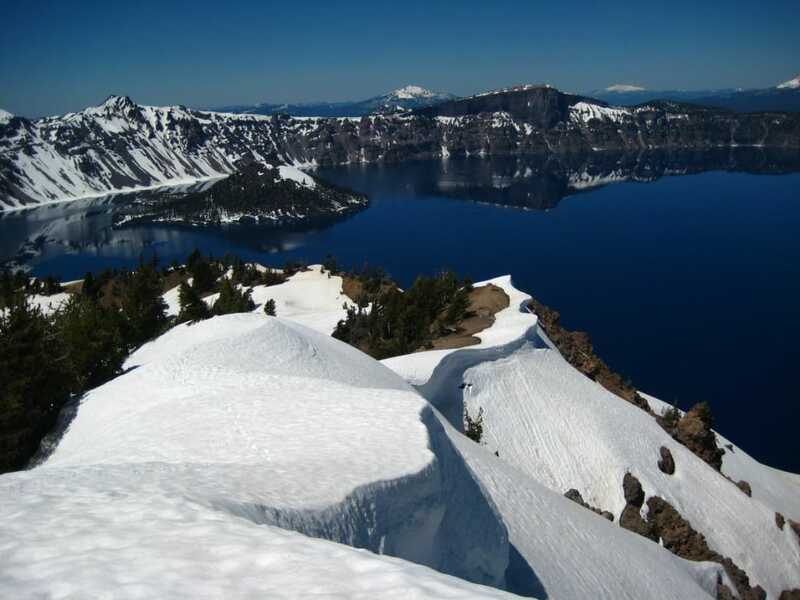 Located in the south central part of the state, Klamath County features hiking trails with breathtaking panoramic views from volcanic peaks, unrivaled mountaintop vistas, and seemingly endless high-alpine lakes to wander and explore. It’s home to Oregon’s only National Park (Crater Lake), as well as numerous wilderness areas and National Forest Service lands. By using the town of Klamath Falls as a basecamp, you’ll find that these seven stunning hikes are all just a short drive away—and they will all remind you why this part of the country has become a top destination for anyone who loves the outdoors. Any time you get to circumnavigate a mountain, wander next to lava fields, and traipse through an old-growth forest, it is a great day. Brown Mountain has it all. This fantastic, shuttle-required hike is located just 39 miles from Klamath. The roughly 15-mile trail (crossing the Pacific Crest Trail 2 miles in) is a great introduction to the natural beauty of the county. While considered to be a somewhat hard hike, the Brown Mountain Loop Trail has only around 1,000 feet of elevation gain, letting you enjoy the wildflowers and occasional glimpses of lava fields without being tired. Found entirely within the often overlooked Mountain Lakes Wilderness, the Mountain Lakes Loop is an awesome family backpacking destination or long day hike. As one of the original wilderness areas designated in 1964, the perfectly square six-by-six mile wilderness region shows off incredible tree-lined alpine lakes, sweeping views, and tall forests. Once a large volcano, the lakes are now the main draw, each with unique character and beauty. 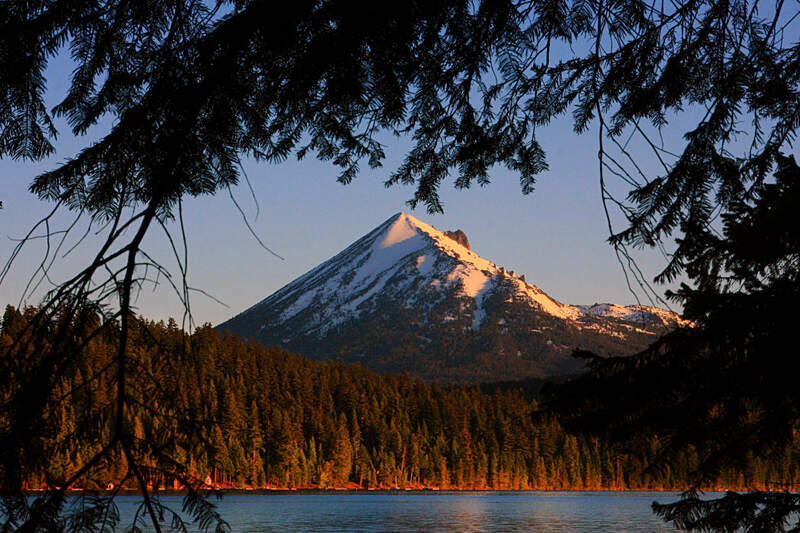 Located just 40 miles from Klamath Falls, the hike is moderate and can vary in distance from 9-12 miles. With many options for where to start, the most popular and well-maintained access point is the Clover Creek Trail. Forty miles from Klamath Falls, the shield volcano known as Pelican Butte is an easily accessed summit, showing off incredible views of the southern Cascade Mountains and Upper Klamath Lake. In winter months, Pelican Butte serves as a popular snowmobiling destination, while in summer months the 9-mile, out-and-back trail doubles as a rough road for ATVs. The views still make this an enjoyable hike or trail run with huge payoffs. Hikers looking for a a good elevation gain along an easy-to-follow trail will love this hike, as it gains nearly 2,300 feet in 4.5 miles. 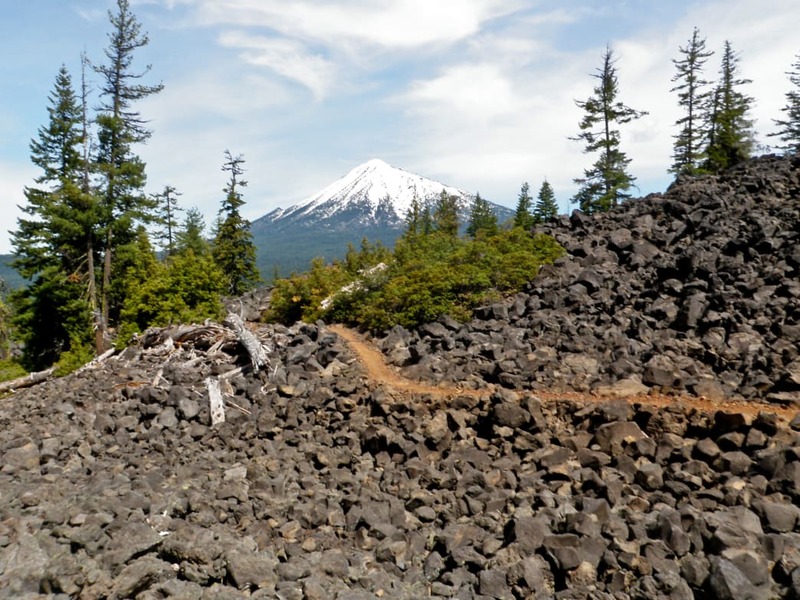 Located partially inside Klamath County, and only 45 miles from the city of Klamath Falls, the nine-mile, out-and-back trail up to the summit of Mount McLoughlin will challenge you. Climbing nearly 4,000 feet up, this long steep hike, with no scrambling or climbing required, rewards those who attempt it with an unrivaled panoramic view. Mount McLoughlin’s summit is a lava cone on top of an inactive composite volcano and while the glaciated slopes of the peak are impressive, the best part of the hike are the summit views, which show off nearly a quarter of the State of Oregon and letting you gaze at Mount Thielsen, Mount Shasta, and even the rim of Crater Lake. As you enter the Sky Lakes Wilderness along the Nannie Creek Trail, you’ll be inspired to make this a return destination for future day hikes and backpacking trips. Reaching Puck Lake is just a five-mile, round-trip hike, perfect for families and those hoping for a short and rewarding hike in pure wilderness. 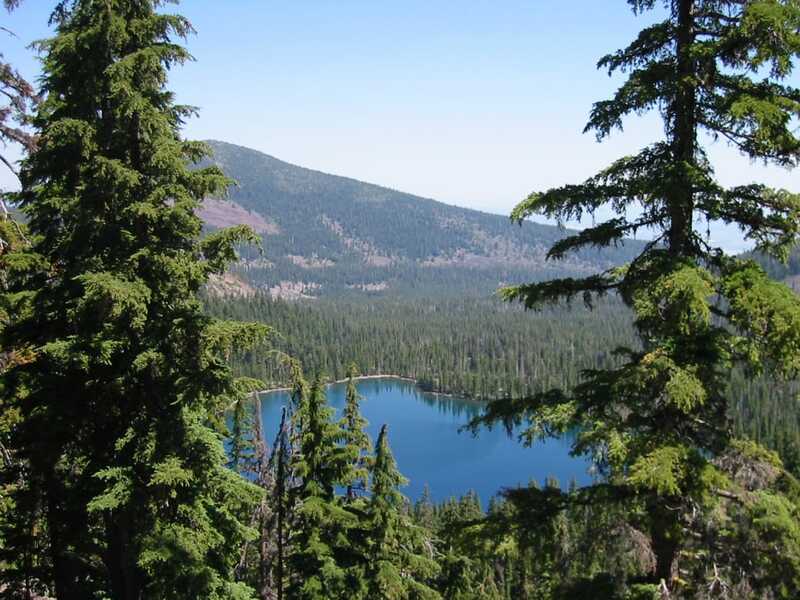 Located just 45 miles from Klamath Falls, this easy hike gains around 600 feet in elevation before showing off the gorgeousness of Puck Lake, where many enjoy fantastic fishing and swimming in the quiet and secluded setting. Those in better shape or needing more wilderness can continue on along the Nannie Creek Trail for another two miles, reaching a fork that leads to more stunning lakes. If you can only climb up to the top of one mountain in Crater Lake National Park, your best bet for ease and views is found atop Garfield Peak. Located near the Crater Lake Lodge, 60 miles from Klamath Falls, the trailhead to the summit is just 1.7 miles, making the entire out and back hike less than four miles. Gaining 900 feet, the steep, but short climb shows off all of Crater Lake and provides you an unrivaled view of the Phantom Ship rock feature. With a well-maintained path to the top, hikers of all abilities, who take their time and bring plenty of food and water, should be able to enjoy the view from the top. Located in the Sky Lakes Wilderness, the 14-mile loop around Seven Lakes Basin is a backpacking trip or long day hike for the ages. Starting at the Seven Lakes Trailhead near Butte Falls, the popular trail climbs 2,400 feet in 5.3 miles to Devil's Peak, where an incredible view is waiting. From Devil’s Peak, the Seven Lakes expand out to one side while Upper Klamath Lake and Mount McLoughlin can be spotted on the other. The highlight of this hike for most is Cliff Lake, which reflects craggy mountains off of pristine waters.